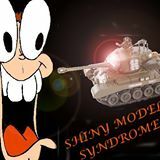 The Shiny Model Syndrome has posted episode 26 of their podcast up online for your listening pleasure. At last, it is finally upon us. GWs flagship force has arrived, and its a doozy... of an average book. We go over the new Codex: Space Marines, the fluff, and the new rules as well. We tell you what we like and think is a big steaming pile of Cruudace. Plus there's a girl in this one somewhere. Seriously, I just saw her, where'd she go... ah oh well, she'll turn up. Enjoy! If you've got anything you'd like us to talk about, comments or opinions, email us at smspodcast@gmail.com!